Arrived at 8:30 and was greeted warmly by Head Chef John Freeman. He took me into the kitchen and introduced me to everyone and I was shown around by one of the brigade. I also met Sat Bains which I was really a highlight. I was made to feel at ease. I was put on the garnish section for the day with a chef called Phil from Dublin. I did jobs for him throughout the day these were cauliflower florets, picked melon, kale crisps, kale puree, smoked squash puree, and other bits and bobs like vac packing etc… I felt like i performed well and did everything that was asked of me. During service I was helping send starters from larder 1 and larder 2 sections. I was helping plate up the dishes like the Chicken Liver Nitro Meusli and roasted Potato dish. I was amazed by how flavour driven the dishes were, yes they looked good but without the foundations of good produce and maximum flavour there would be no soul. During service chef Sat Bains asked me about Hampton manor, the food style and the ethos etc… i was happy he was interested and it got me thinking about the things i could take from here and implement back at the Manor for example the garden is rife with fresh herbs from the glasshouse, literally from garden to plate, snipped to order. Fresh as! I tried a few things to, i had some coal mayonnaise which just blew my mind and just had to get the recipe, it was epic.. Ill definitely be using that sometime. I really enjoyed my first day. My second day was as enjoyable and more immersive as the first day. I was in the prep kitchen with chef Paulo formally of the Waterside Inn, Bray. It was good to see the backbone to what gets served up i.e seeing the sauces being made with such care and attention. The way the Pigeon was handled was first class, just pure respect for the produce. I did jobs throughout the day these where cracking grouse bones for sauce, flaking down confit pigeon legs, dicing beef for tartare, flaking down confit hare legs, separating the thigh meat from the bone of grouse legs, and other elements. During service I was in the Pastry section and it was awesome. I got to try loads of elements and even whole dishes. I was blown away yet again this time by the Milk dessert. It was stunning, packed a punch but as you ate it, you finished off with a clean palate from the milk ice cream. Superbly balanced. Also the chocolate just blew my taste buds out of the water. It had a 12 year aged balsamic vinegar that was so intense and so aged it almost had a brandy taste to it, deep and delicious. I helped out plating up throughout the night and felt like i was part of the team. Roll on tomorrow! Today i helped Phil on the Garnish. I made kale puree, kale crisps and shelled broad beans. Also i made carrot puree. In the evening i was in the development kitchen known as Nucleus. This is where they do a menu with things that are being experimented with. It was epic; we did a table of four and we served and cooked the food. It is a real immersive experience and you get to have a lot of conversation with the guests who were amazed and wanted to know more about the product and the whole process. It was really nice to see that kind of interaction. It was also great to see all the different experiments that were going on with the flavour combinations. 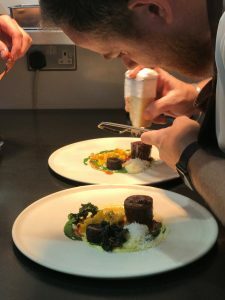 Even though it is a development kitchen where the dishes are tested and trialled, it still managed to have that focus and edge, the same as you’d have if you where dining in the restaurant. Brilliant. I helped out in the main kitchen and cooked my dish. I was pleased with my dish, everything was tasty and the feedback was positive. My fingers are crossed to see what happens, hopefully I’ve done enough, not just with the dish, but overall throughout the week. I have gained a lot of new techniques and methods and it was amazing to see such a high standard. These memories will be with me for the rest of my career and will help me develop into the best chef I can be.